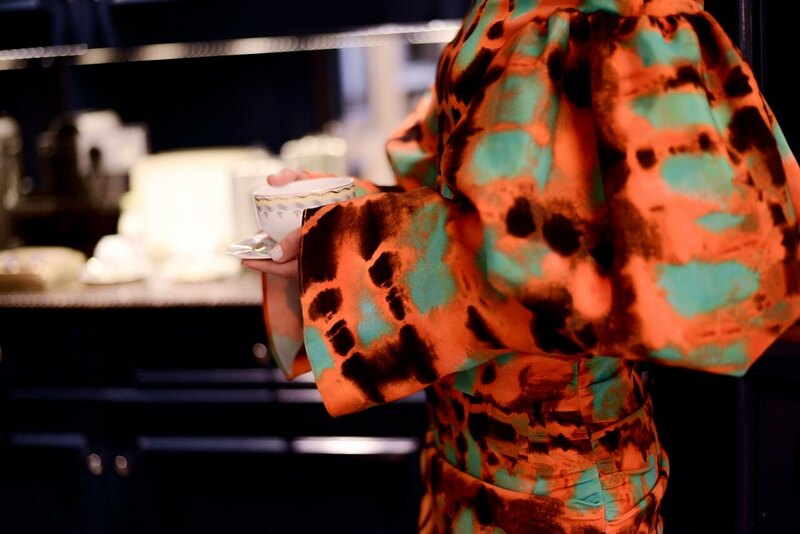 I was lucky enough to wear this beautiful, eye-catching and almost psychedelic Ellery’s dress. Ellery is no doubt one of my favorite Australian designers. I’ve always loved her signature oversized bell sleeves and flares. Her collections are always full of bohemian statement pieces that can be easily pulled up or down. After moving from Sydney to Paris, Kym Ellery’s got inspired for her FW17/18 collection from the dress codes of the most bourgeois parts of the city including the famous Avenue Montaigne. Combining it with the laid-back hippie spirit of Sydney as her hometown results in an outstanding collection, that can be easily translated into any cool girl wardrobe as each piece is unconventionally luxurious yet not too polished or sophisticated. The dress I was wearing has this bourgeois’-bohemian spirit; the fabric of tie-dye-style prints was created by Ellery’s mother, a textile designer. I loved to style this eye-catching dress with some flat boots in purple velvet, to cool down the look. To enjoy the holiday spirit around Paris, that in this period definitely deserves to be called the city of lights, I pulled on Ellery’s maxi coat, perfect to keep me warm and classy while strolling around the town. 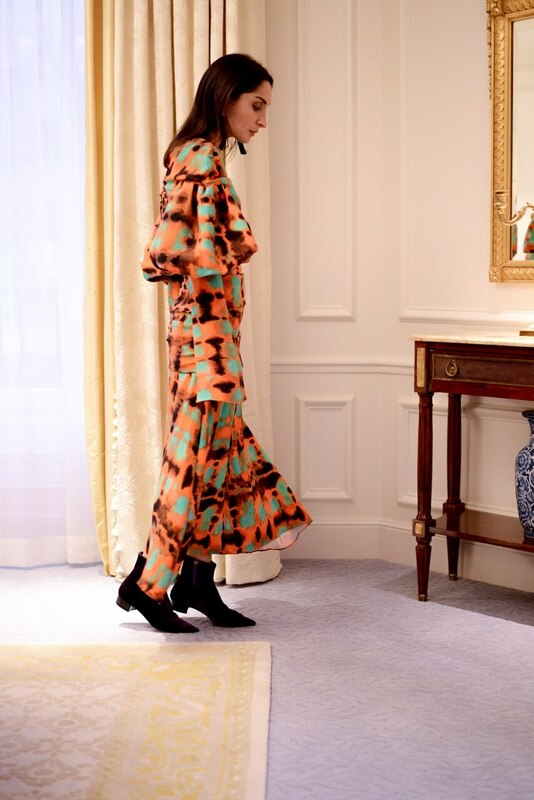 No need to say, Ellery has this way of making feminine pieces with a bold statement that make us feel bourgeoisie and bohemian at the same time. I wore the Ellery embellished coat over an eye-catching Delfi Collective mini dress and paired it with some statement Azzaro over-the-knee boots, perfect for the season. To finish the look I wore my recently favorite Mark Cross structured bag, that reminds me of a doctor’s bag, and adds some extra elegance and structure to every look. I am so inspired by you Erin!!! These images take my breath away! I love this powerful Ellery dress and the pattern is amazing!! You look so regal as always! Wow what inspiration and colorful looks! Thank you for your feedback dear! Wow, these looks are impressive! I’m a huge fan of Australian fashion designers. Thanks for sharing! Thanks for your support dear. You look amazing in that dress! Love the colour and those statement sleeves. Beautiful locations , gorgeous outfits! You are always stunning! I love that your posts are so lush!! Thank you dear, you are so kind. I really loved this shoot as well, the location and the outfits were so dreamy. Both outfits look absolutely stunning on you! Love everything i saw! Thank you love. I appreciate your kind words a lot. Obsessed with these outfits! You look so chic and amazing! !